A few weeks ago a group of friends headed off to Pacific City, Oregon for one of the last summer weekends. 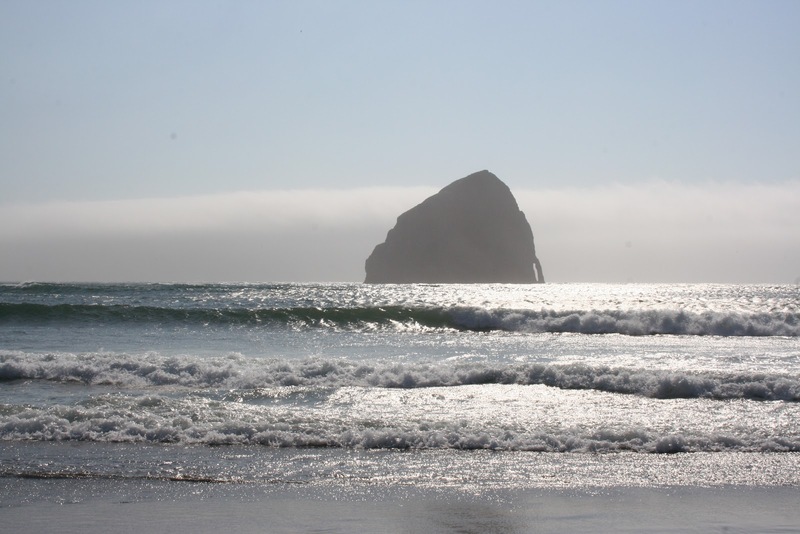 With temperatures cooler in the easterly cities, we hoped to avoid the ubiquitous fog that generally shrouds the Cape Kiwanda shoreline. Not so – we had foggy conditions throughout the weekend. The picture to the left shows one of the big sun breaks and an average of the wave conditions. Sure, the occasional larger set rolled in. and so did the wind. The picture to the right shows the chaotic sets we enjoyed for most of Saturday. An interesting thing to note is the lack of crowds on the water. Many who came to check out the surf left grumbling about this or that, fog or wind or chill or wave speed. When we got out about 9:30 there were a few prone surfers and about 5 standup surfers. The sets were fairly infrequent so paddling out wasn’t too difficult, staying up while waiting for a wave – more so! 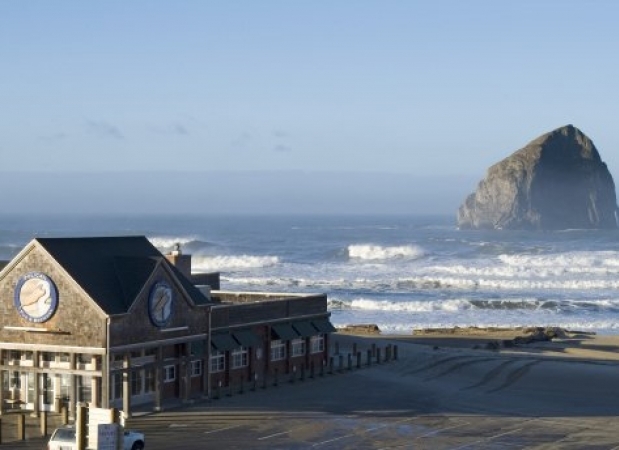 Looking over to the southerly side of the haystack rock, just off the south corner of the Pelican Pub, I noticed a silhouette and surf style that’s not easy to miss. It was Gerry Lopez. He’d been out long before any of us. With ease, he’d caught dozens upon dozens of rides that made the graceful most of every wave. The exact same waves deemed not good enough for many who’d visited the shore that day, were providing plenty of rides for one of surfing’s greatest – and for hours on end. In the few hours I was out there honing more standing and balancing than surfing skills, I watched Gerry watch the waves. Patience to look for the right wave is not my forte, so I learned as I watched him watch. Observing his easy-powerful paddle strokes and graceful rides provided some serious lessons. On each wave, Gerry decided when to cut out of the wave to both avoid getting tousled in the washing machine shore break and to make the paddle out an easier task. Simply being aware of that important phase of riding the wave – exiting it at the right time – can save a lot of hard work. I reflected on that surf session today at noon, oddly, while stretching into a forward fold at Groove Yoga. Instructor Cynthia Latimer was giving just the class my mind and body needed. She was bringing our breath and focus to the mat with the unique spirit she shares via her teaching I looked at my mat below my bare toes and considered if riding my breath and movement in this yoga class was really so different from riding a wave. This just right class seemed in many a bit like the ONE wave last Saturday. Similarly, that wave was just naturally, easily right too. In the moment when you get to your favorite surf beach and it is too flat, too hot, too windy or not enough of something, consider making the most of that moment. If there is a way to go with the flow in a manner different than the agenda that brought you to that beach or that moment, consider making a considered, aware choice on how to live it. At work, at play, on your yoga mat, and of course in the ocean, surf is where you find it. And being a “surfer” is what you make it.